Dr. Derrick left) is presented the Presidential Citation at recent AUA meeting. 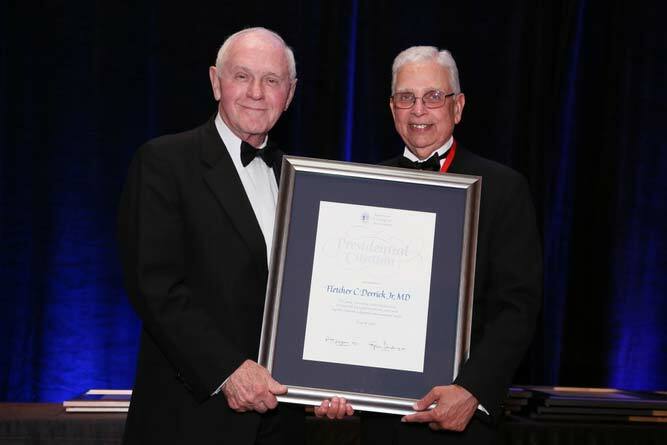 At its annual meeting held in Orlando, Fla., May 20, 2014, The American Urological Association recognized Dr. Fletcher Derrick with a Presidential Citation for long standing contributions to urological education, patient care, and superb clinical judgments and surgical skills. Dr. Derrick is a Johnston native and was educated in Johnston Public Schools, Clemson University, and Medical University of South Carolina. He was Professor and Chairman of urology at George Washington University Medical School in Washington, D.C., for several years before returning to MUSC as Clinical Professor of urology, and continues private practice four ½ days a week. He has authored 75 articles, two books, and several book chapters, and three movies. He has served as a consultant to the Surgeon General of The Army and on medical missions to Nepal and Nigeria. He is the oldest Urologist in America still practicing as he has done for 54 years. Derrick was in the Army Medical Corps in Germany 1959 – 1962, first at Baumholder as surgeon for the 8th Division Artillery, and subsequently at Landstuhl Army Hospital where he began his urological studies. As a long time citizen of Charleston he has been involved in the community as President of The Trident Chamber of Commerce and President of The Charleston County Medical Society. Dr. Derrick is the son of the late Fletcher (Ruby Ripley) C. Derrick, Sr. of Johnston.